July 16, 2014 – Legendary blues musician Johnny Winter died in his hotel room in Zurich, Switzerland, on July 16th, 2014 at age 70. There are plenty of reasons why that’s notable — Winter was one of the first blues rock guitar virtuosos, releasing a string of popular and fiery albums in the late Sixties and early Seventies, becoming an arena-level concert draw in the process — but it’s the barest facts that remain the most inspiring. Johnny Dawson Winter, who was born on February 23rd, 1944 in little Beaumont, Texas, afflicted with albinism and 20/400 eyesight in one eye and 20/600 in the other, made an iconic life for himself by playing the blues. Winter was that, no doubt, but also a testament to the idea that with a lot of skill and dedication and more than a little luck, music can open any door. He and his younger Edgar – both born with albinism – appeared as a duo on a local children’s show in the mid 50s, singing songs and playing ukulele. By the time Johnny was 15 he had formed a band, Johnny and the Jammers, and released “School Day Blues” on a local Houston record label. Also in these early days he sometimes sat in with Roy Head and the Traits when they performed in the Beaumont area. In 1967, Johnny recorded a single with the Traits, “Tramp” backed with “Parchman Farm” and in 1968, he released his first album The Progressive Blues Experiment. It’s probably overly romantic to say that one can hear any sort of outsider’s howl in Winter’s playing, which first came to wider attention via a 1968 Rolling Stone article that praised him for some of the most “gutsiest, fluid guitar you ever heard,” but at its best, there’s a beautifully articulated flamboyance to his music. Faster and flashier than his blues god contemporary Eric Clapton, Winter’s musicianship — a hyperactive, high-octane intensity was his great blues innovation — had the electric flair of someone who was determined to take charge of how he was seen by others. It was as if his playing (and his gutsy singing) was a challenge to audiences. Okay, you’re looking at me? Then watch this. As a concert draw and big-seller, Winter peaked in by the mid-Seventies. (New listeners should start with 1969’s Second Winter; this year’s True To The Blues compilation is comprehensive.) But stepping out of stardom’s spotlight gave him the opportunity to do his most valuable work, as a steward to the music that changed his life. Starting in 1977, Winter produced a trio of swaggering, earthy albums for blues genius Muddy Waters, of which Hard Again is the first and best. Those albums reconnected Waters with his own greatness — Muddy’s prior Seventies albums had been uninspired — and delivered him a late-in-life critical and commercial triumph. After Waters died in 1983, Winter, who by then had already inspired followers like his fellow Texan Stevie Ray Vaughan, settled into a journeyman’s role, releasing albums at a steady pace and touring even more frequently than that. It wasn’t always an easy ride— there were struggles with addiction and duplicitous management — but it was as good, and honorable, as a blues musician can ask for. They wouldn’t be called the blues if everything was rosy. When he wasn’t on the road, Winter, who, it must be said, cut a striking figure on-stage up through his last gigs, spent his time with his wife at home in rural Connecticut, and was able to bask in the respect of fellow musicians, a testament to the truth that if you give your being to the music you love, the music can turn that being into a remarkable life. His now-posthumous upcoming release, Step Back, is due out in September and features appearances from Clapton, ZZ Top’s Billy Gibbons, Ben Harper, Dr. John, Aerosmith’s Joe Perry and others. They all knew what Winter meant. 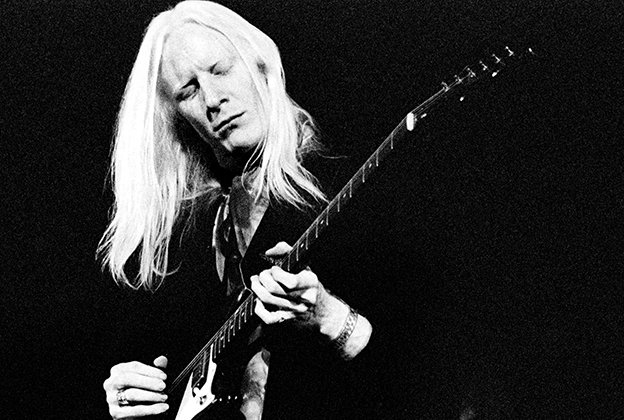 Johnny Winter was much more than that.